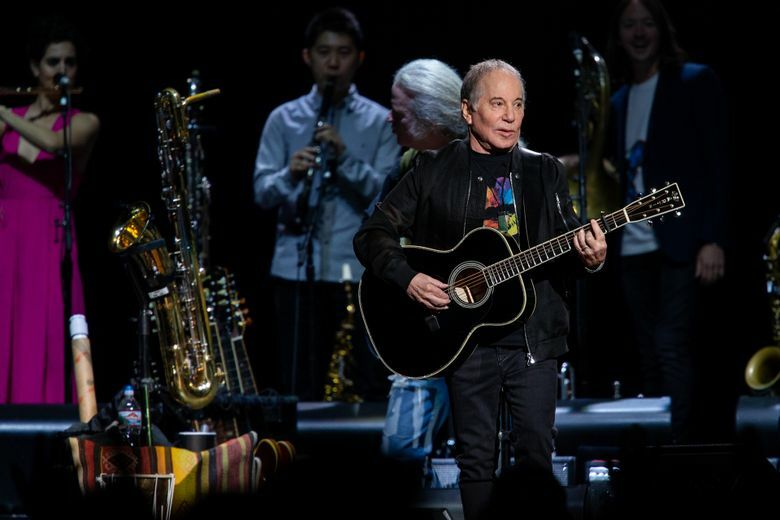 One of pop music's greatest songwriters, Paul Simon says goodbye during the second stop of his farewell tour at a packed KeyArena. 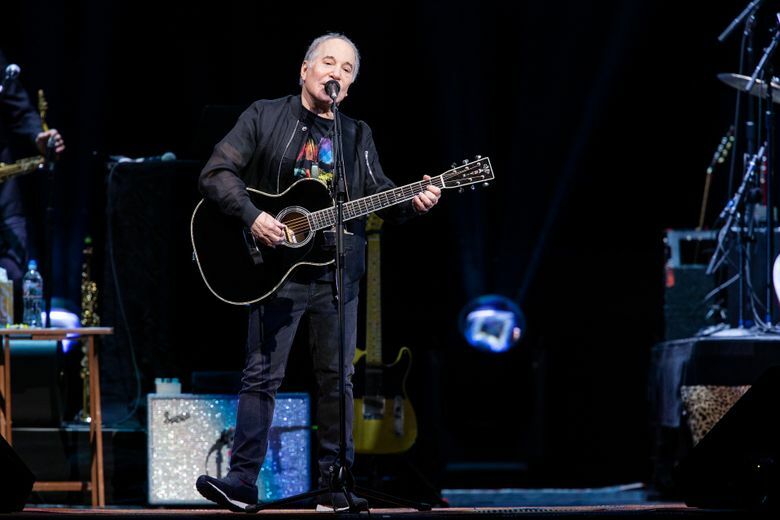 Four songs into his two-hour-plus set, Paul Simon decided to give the seated crowd at a packed KeyArena a gentle PSA. “The way I feel is, if you feel like getting up and dancing sometimes …” he said, trailing off with an implied wink. While Simon often seemed reflective — musing fondly on being a conduit for an “extraordinary” creative spirit when writing “Graceland” and recalling finding inspiration in a book of René Magritte paintings he flipped through at Joan Baez’s living room — after a few songs, it was easy to forget that this is a retirement run of sorts. (Simon’s stated that while this may be his last major tour, he still plans to make music and perform less extensively). Granted, he’s not falling into the crowd like Bruce Springsteen, but the 76-year-old performer showed no obvious signs of needing to hang it up. One of pop’s great chameleons, Simon’s been cribbing notes from world music long before Rihanna discovered dancehall, and his embrace of African and Caribbean rhythms into his pop-folk fold has proved timelessly infectious. As the reggae-gospel swing of “Mother and Child Reunion” set in, two women in their 20s or 30s popped up, turning apologetically to the seated crowd behind them. But when the first notes of “Me and Julio Down by the Schoolyard” strummed in, the rest of the section joined them in dancing through one of Simon’s most famous hits. 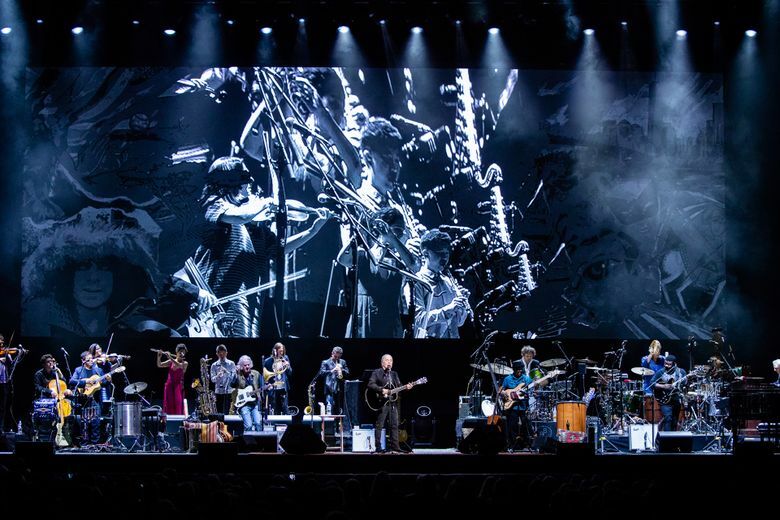 Similarly, “You Can Call Me Al,” which capped the pre-encore portion, had fans across generations singing in unison, whether they discovered Simon through a first pressing of “Bridge Over Troubled Water” or their first karaoke bar. The many shades of Paul were on display throughout the (two) encores, as “Mrs. Robinson” simmered into a bayou blues romper fit for a crawdad boil, before Simon played jazz crooner on “Still Crazy After All These Years” — a song as classic as your favorite table at your favorite supperclub. Even as now-common farewell tours become increasingly perfunctory, this felt like one to remember.